Do you heat with forced-air and already have ductwork? Simply install a cooling coil on your furnace and tie it into an outside condenser. Done! Do you heat with a boiler and live in a house that could accommodate ductwork in the walls? You’ll need an air handler in the house and a condenser outside, and then you can run ductwork to registers in the basement ceiling and the attic floor to cool both first and second floors. Can’t accommodate traditional ductwork but could accommodate the smaller high-velocity flex tubing, which requires considerably less space? This is often a great solution in an older home. You’ll need to install the tubing, as well as a condenser outside and a high-velocity air handler inside. Do you heat with a boiler but have no wall space for either ductwork or flex tubing? You can install an air handler in the basement with registers in the ceiling to cool the first floor and another air handler in the attic with registers in the floor to cool the second floor. You’ll also need a condenser outside. Don’t have space for air handlers? You can fit wall-mounted ductless split cooling/heat pumps. 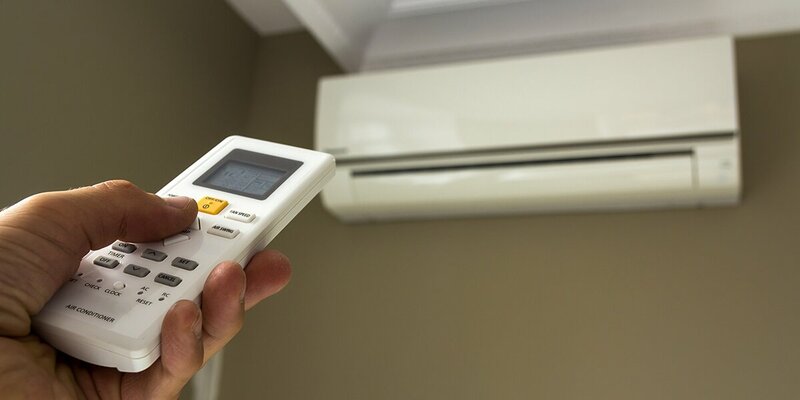 They can be fitted in multiple rooms in the house and on either internal or external walls so long as they can be connected, via refrigerant lines, to an outside condenser. And, as well as wonderful cool air all summer long, they can provide heat in the fall and spring when it’s cold out but not yet freezing. Summer may seem a long way off but before you know it we’ll be reaching for the shorts and the fans. Don’t wait until July when you’re already hot under the collar, call us today at 603.430.9919 and start exploring your options.